Google’s products are always evolving, AdWords, Gmail, Maps are hardly the same from one week to the next. So it was no surprise this week, when Google unleashed a whole bunch of new features on Google Maps. Local search is changing and Google and Yahoo have started to deliver a new suite of products, specifically designed to give people results, richly populated with local data, photos, reviews and anything else which has a geographical tag associated with it. Let’s look at the first major change, the left hand navigation column, now has a little snippet of text which says “Explore this area” Below that text is now a selection of images from that location. Big deal you may think, but look a little closer and click on the explore this area link. 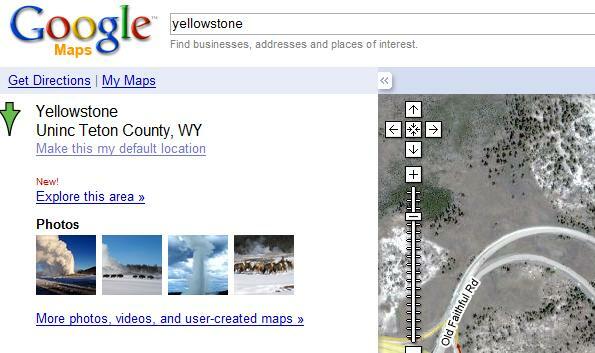 Ok, so we have the map open and we can see Yellowstone, old faithful and everything else within the area. Now, let’s click on “Explore this area” and really see what this feature does. You should see some images appear, on the main map interface that look something like this picture below. The beautiful thing about this, is that this content is from the general public, peoples personal experiences with the area you are looking at. Not just some salesperson, trying to convince you about how great the holiday will be. You can now explore photos, videos, reviews and get a much more immersed within the area, all through the use of Google Maps. 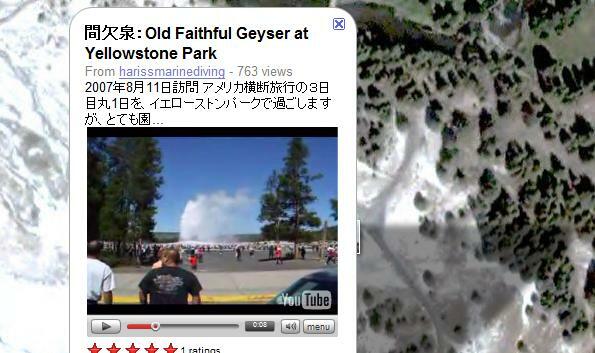 Let’s do a little exploring on this Yellowstone map we have open, i clicked on one of the images of the world famous geyser known as “old faithful” and bang what’s this, its a youtube video somebody took of old faithful playing within Google maps. I’m not going to go through the interface image by image for you, i suggest just opening up Google Maps, searching for something that you know well, clicking explore and then seeing the quality of content you can find. I Expect that the amount of content and the quality of it is only going to increase exponentially as people start to tag their holiday snaps with geographical data, so lookout for new refinements to this feature. Maps gets real – Google maps now featuring real estate listings. Ok, so we have just seen the new explore this area feature and all that comes along with it but did you think they would stop there? Every real estate site that i use to look for houses (I am currently looking to buy so i visit them frequently) seems to use Google Maps to show me, exactly where the house is. So, it seems only logical for Google to do the opposite and start to integrate real estate listings directly into Maps. The biggest problem i have when searching through real estate sites, is the fact that their search is, well, extremely bad and outdated. I dont want to search by price range or number of bedrooms, i would prefer to search by location and then choose from the houses i like, all the while keeping in mind which streets the house is on and how far it is from work. Let’s do an example real estate search, to do this you will need to click on “show search options” on the right hand side of your maps search box, then from the dropdown choose real estate. Now do a search for your favourite location and you are browsing real estate listings with photos and descriptions. The implications of this little addition are huge for the real estate industry. Google could effectively, allow people to sell their house, directly through Adwords and cut out the middleman real estate site. I’m not going to go into detail about my thoughts on that in this article as i am preparing a seperate, more in-depth commentary about that topic. Stay tuned! In the meantime, i suggest keeping an eye out for these new little icons that popup from time to time on Google Maps and play with them as much as possible. 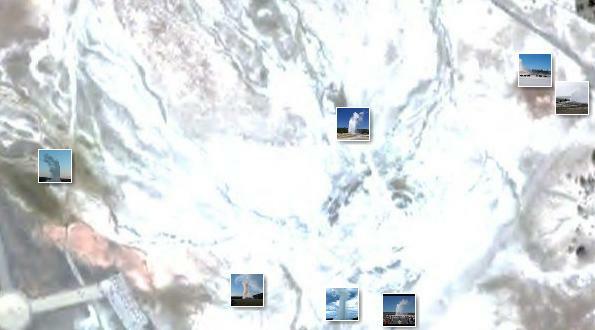 Not really new features, just features from google earth that crossed over.